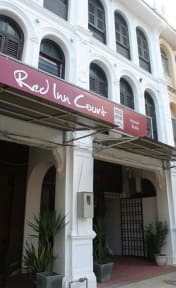 Red Inn Court i Penang, Malaysia: Bestill nå! 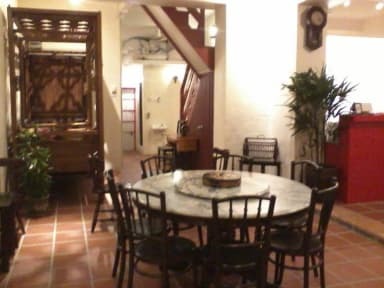 A Heritage Experience for the Weary Traveler, Red Inn Court is a boutique eco-guesthouse centrally located in Georgetown, Penang, a UNESCO World Heritage Site. Every stay becomes a memorable experience characterizes the hospitality one can expect from Red Inn Court. Your stay will be infused within an oasis of myriad cultural experiences that make up our heritage. Use our guesthouse as the starting point to a day of exploration. Many of Penang's prime heritage attractions are only minutes away. After a long day's walkabout, return to the warmth among friends and little home conveniences. We offer free Wi-Fi, free breakfast, free use of Internet PCs, a kitchenette, a Lanna area, in-house movies, free flow hot/cold drinking water, book exchange, lounge area, hot spa showers and that little extra touch unique to us.